When I was growing up, every day I dreamed of escape. I envisioned myself running away from home and living on my own just as The Boxcar Children. I wanted to run as far away from the mania as my little legs would take me. The abuse was not the only reason I dreamed of abdication. The insanity that revolved around my mother’s relationships constantly brought me to the brink of delirium. Because of all the abuse and neglect that I endured, most of the relationships I’ve had were not very positive. I often repeated the very circumstances I loathed. My mother lived in fear of my step-father. He treated her badly, but she begged him not to leave her. He cheated on her and even fathered two children with another woman , yet she ignored his infidelity. She was not a model of love for me, but a model of fear. She taught me how to be afraid of being alone, and to allow others to take advantage of me. If I did, I would get the love and attention that I desired all my life. Instead of escaping, I allowed myself to become a victim, just like my mother. My mother displayed little or no emotion, other than anger and fear. This left me afraid of my own feelings. Without a healthy demonstration of how to control the powerful emotions that people feel from time to time, I acted out in destructive ways. I craved attention to such a degree that any attention was better than none. I naively believed that my mother and my family situation reflected the entire world. This was just the way it was. There was nothing I could do to change it. Change needed to happen, though. That was inevitable. As gullible as I was, I thought that the change that needed to happen was within me. So, I changed, and changed quite often. I became a chameleon of sorts who learned to adapt to any situation. This flexibility due to the chaos of my childhood became an asset to me later in life. In childhood, it made it very difficult for me to understand who I was since I was often changing my persona to fit the demands of others. I created an alternative reality. I lived an imaginary life. I often molded myself to fit or fix any situation. As a child, I was told again and again that I was responsible for my mother’s happiness. “If it weren’t for you, I…” completed by some dream gone awry was aimed toward me time and time again by my mother. It burdened me with tremendous guilt, and I felt as though I owed penance for being alive. I was obliged to my mother for giving me birth, and for that, I owed her my life as the cost of her happiness. Of course, today, I realize that this line of thinking is ludicrous. As I grew, I still was unaware of myself, but became keenly aware of others’ thoughts and feelings. No matter how hard I tried, how well I managed, or how successful I was on the outside, peace of mind evaded me. My adult life reflected my old responses to my chaotic childhood because I did not know how to make healthy choices. Somehow, I managed to allow my personality to break through, and with that, I decided that the obligation that I have inside me is to myself. I am responsible for me, and me alone. Taking accountability for my own happiness is daunting, but if I do not take it, then who will? It is certainly not the responsibility of a child to make their mother happy. People are responsible for their own happiness and often create their own unhappiness by making poor choices. It is the reponsibility of a parent to help their child find happiness in life by setting a good example and sadly your mother was not a good role model. Have you ever considered writing a book about your life? You certainly have a talent for writing and a book might help other people in similar situations. Someday I’m going to write a book about my tumultuous life. Take care! Wow! Thank you for the compliments! I have considered writing a book, but I wouldn’t know the first thing about having it published. I’ve written a “first chapter” of my first memory of abuse. It’s very long, so I’m not certain if I should post it or not. You, too, should write your story now, as you are growing so that you can remember how you felt before you were completely healed. You are certainly talented at writing, too! I’ve just discovered recently that it isn’t hard to get a book published. Self-publishing is getting so commonplace today especially with the i-books. I just finished writing a book (Grandma’s Notes on Parenting) and found a company called BLURB that does self-publishing so I got my book published this week. They have templates to use for any size book you want to write – all you have to do is write a story or upload pictures – then you send it to them for publishing. They have set prices and you put your markup on it, then wait for your book to sell. All you have to do is buy 1 copy and they will keep it in their bookstore for 1 year – of course if you sell lots they keep it there forever and you keep making money. Check it out – http://www.blurb.com. There are other companies that do this, but this one seemed the easiest to figure out. Thank you for your comment about my writing. I too know what it feels like to be blamed for a mother’s happiness. What I have finally learned is that her happiness or unhappiness has nothing to do with my but the choices she made in her life out of fear. I have often wondered what my life would have been like if my mother had joy in her life. I can only be held accuntable for my happiness and that in itself is one of life’s greatest struggles. Thank you for replying, Ivonne. I’m sorry that you’ve had to endure a mother like mine. At least you are able to recognize the abuse and get away from it. I’ve wondered, too, what my life had been like had I had a mother who was “normal.” But then again, some of my best assets are in direct result of the abuse I experience. The example I gave as being a chameleon is no exaggeration! I too had been blamed for my mother’s unhappiness as a child and sometimes even recently. What I have come to understand is that my mother’s unhappiness is as a result of the choices she made out of fear. We can only responsible for our own happiness and no one else’s. To be happy indeed has been one of my great struggles in life. I othen wonder what my life would have been like if my mother would have had joy in her life. Another powerful and incredibly eloquent post. It made me shiver again to see how exactly your story is also mine. “I am responsible for me, and me alone.” – you wrote. The effects of her evil genius in gaslighting me, in planting fear, worries, guilt and self-doubt into me are far-reaching, and I find it impossible to be able to correct, undo or mend either myself, my past, my future, and can’t rewrite my life in a way where all the potentials that my mother has taken away from me would be given. Thus I believe I cannot be held responsible for the effects of what she has done against me and whatever I have become. Even by extorting the biggest efforts, and with the help of my therapist, I can achieve so little. I’m so sorry that you’ve had to live such a sordid existence with a narcissist, too. It’s true that you cannot rewrite a life, which is what many people who have been abused attempt to do. But I’m not certain that you are giving yourself enough credit. By recognizing the effects of the abuse you endured as problematic, you ARE taking responsibility. There are often things that we do that are directly connected to the abuse, yet, we are not aware of it. If you are not aware, how can you take on responsibility? I’m sure that your therapist would agree that working on the “problems” that arose from your abusive mother is a huge step in taking responsibility. Right now, you can achieve so little, but one day, you will be free if you believe in that. Your name “Healing Wanderer” says that you are on the way. Good luck and thanks for reading! I’d like to know more of your story, so I’m going to check out your blog. ~N – thank you so much for your kind and thoughtful reply. You have put the meaning of responsibility into a brand new perspective. You are right – in this regard I did make progress; this is probably why I put the “healing” into my name: to give myself some credit or at least leave that option open. The choice that I have made is the choice my family members refuse to make out of convenience, and they hate me for no reason, or just because they choose to believe my mother’s lies. Whenever I think about this, yet I am not so sure if I had a choice at all. I was born to be a scapegoat in this family … and it seems that my mother – and family – prepared this fate for me from the start. If we consider responsibility from the angle you suggested I can say I did take the responsibility to make the right moral choice of never wanting to hurt anyone, which is essentially different from my family member’s stance and of many I have encountered in my life. Although I can’t say I love my mother after all she has done against me, at least I wish her (them) well, whereas my family has done everything to undermine my existence in every possible way, emotionally, mentally, financially. It is indeed a sheer miracle that I am alive. What I can’t make much progress with is the way how I look at life and at myself. It appears to be something that I can’t choose – it is indeed solely the result of the hurtful experiences I have had. The only way I can deal with it is through laughing at it… but that kind of laughter is just another weird place to be, as I don’t think may can follow me there. Regarding your writing – I did mean all my words : ) Your blog is one of those I enjoy the most. You are a brilliant writer and a wonderful person. I am thankful beyond words for your continuing support and deeply honoured that you visit my blog. Your family has obviously damaged you tremendously, yet you still managed to become a wise and obviously intelligent, caring adult. Credit must be given for that amazing feat. There was a time when I “divorced” certain members of my family, and in its place, I found friends who nurtured me the way a family should. Other members of my family were there for me, so in that, I was fortunate. I thought that my mother fooled many people in my family with her lies as well, and I thought that those people would always believe her. What I did not know is that they were struggling to come to terms with her behavior towards them as well. Thank you so much for your kind words in your reply! You can email me directly if you’d like: mymendingwall@gmail.com or you can reply on the blog. Just thought you may want the option. Thanks again! Check my post Monday. You have been nominated! I hope it does. What you say should be heard by more people. I know it helps me to read and talk with those who are coping with problems. 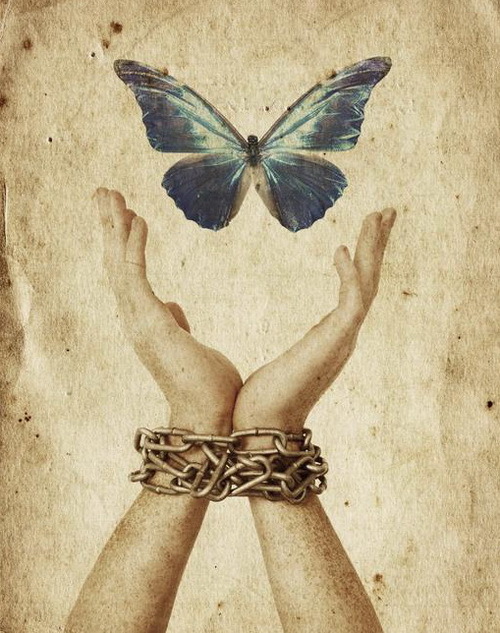 You are an outlet for so many who are bound by their chains of restrictions. I am so glad I came across your blog. I love your blog. However, the more I get to know you, it’s interesting that I can identify somewhat with your mother. I think I’ve let you know that I had a lot of trauma as a child, but of course, all family situations are different. As I read more of your blog, I’m starting to reflect on my own children’s experience. Like you, they had the unsettling experience of seeing my personal struggles with men in my life. But, not to the extent that you did. Fortunately, for them, I think I was able to prevent such things from ever reaching a point at which I appeared to be out of control of what they experienced. As a result, we (the kids and I) have clear reference points about what went right, as well as what went wrong in their upbringing. As it turns out, of course, I was not, could not, totally be in control, and with one of my kids, he resents certain things which he mistakenly perceives me as having “engineered”. But, that’s better than confusion which becomes “unspeakable”. I think my parents–who did stick together, come the hell and high water they themselves provoked–managed to model for me at least that much awareness of my responsibility to myself and those in my care. As I’m writing this–at this point, I don’t think I’m making any sense. Let’s just suffice to say that your blog really speaks to issues that probably affect a great many families in today’s society, where the parents have not remained committed to the family, and the custodial parent loses sight of his/her obligation to model reasonable adult behavior. Crazy as my parents seemed to be, at least they were sort of “checks and balances” on each other. Interesting perspective as usual! You always make me think from so many other vantage points in your responses. The one thing that you were not (it only stands to reason from the contents of your responses because I don’t really know you, but I do know you, so…) is a narcissist. My mother is a text book example. However, I have learned not to no longer look at her with my rose colored glasses, but to see her as a person who is sick and damaged, by what, I may never know. I love my mother, but I cannot love her as a mother, but rather, as a fellow human being who has suffered some atrocity that would cause her to develop this personality disorder. Also, I believe you are correct in that today’s society has a great deal more cases of the break-down of the family unit, or at least it is more publicized. In my profession, though, I have seen more and more families with parents who don’t have the time to give the attention to children that they desperately need. I see the suffering of these children each and every day, and can empathize greatly. This is why I believe that it was my Higher Power’s will for me to be in the profession that I am in working with children each day, and trying to make a difference. Thanks for your compliments, but more importantly, I love the way you set my brain to contemplate other view points! Every time I read your entries I am swept away…like on a tunnel waterslide that is scary and unpredictable but that I know will come out well at the end…It’s like I relive things when I read your entries, and things are loosened up that I had forgotten or buried. I am always inspired. Tonight I wanted to write and reflect as a result of reading this entry of yours but I am too sleepy. Hopefully tomorrow. I also just wanted to say, you said towards the end of this post, “Somehow, I managed to allow my personality to break through.” I am painfully aware of how ‘stuffed’ I (my personality, my ‘self’) still remain, and I look forward to the time (if you haven’t already) if you ever feel compelled to write about some moments of ‘your personality breaking through’ that you experienced, or even noticed in hindsight. I feel like your moments might be inspiring to hear (read). Thank you again for being ‘here’. Thanks for the compliments! I am even more appreciative of your encouragement of a new post topic. I have about five posts somewhat written, but I have to definitely be inspired. My brain is reeling in reflection of how I managed to become myself in the end, despite all the pressure to be the Barbie doll of my narcissistic mother.